Dublin is a fun city to visit, and a must if you’re heading to Ireland. We always enjoy visiting, meeting the locals and of course, sampling some of the good stuff! By which I mean Guinness of course. In today’s post, we’re going to share with you our idea of how to spend 2 days in Dublin. We’re going to cover many of our favourite sights, which include some of the best museums and other major attractions, as well as a few curveballs you might not have thought of. We’ll also be sharing our tips on where to stay in Dublin, how to save money on your visit, some practical tips as well as plenty of photos to get you excited Dublin trip! Our first day exploring Dublin has us learning about Irish history and visiting some classic sights. It’s a busy day, but you’re always welcome to adjust the itinerary to suit your interests and pace of course! If you’re visiting Ireland from the USA, there’s a chance that you have Irish heritage. Over the years, millions of Irish people have emigrated from Ireland, settling all over the world – with a great many of them heading west across the ocean to the New World. EPIC, The Irish Emigration Museum tells the story of these people. 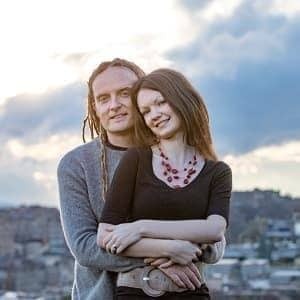 What drove them to emigrate, what the emigration process was like, and the sort of lives they built for themselves in their final destination. It’s a very interactive experience, and you are issued with a passport when you enter, which you stamp as you proceed through the story. We both enjoyed it, and learnt a great deal. There’s a fee to enter, around €14 at time of writing. Free to holders of the Dublin Pass. Just across the road from the Irish Emigration Museum is the Jeanie Johnston tallship. This is an accurate replica of the original Jeanie Johnston – a three masted ship that was originally built to carry cargo between Ireland and North America. During the Irish Famine in the mid-19th century though, the Jeanie Johnston was used to transport emigrants from Ireland to the USA. In this period in Irish history, over a million people left the country, with a million more dying at home. The Jeanie Johnston made 16 emigrant voyages, and is notable for not losing a single passenger or crew member on any of her voyages. A visit to the replica ship will give you a sense of what life on board for these emigrants and crew would have been like, and is quite a moving experience. 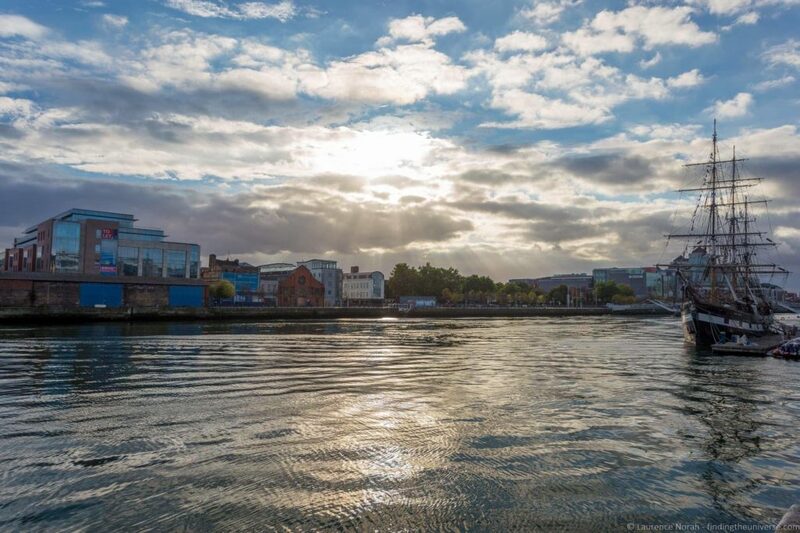 When we visited, one of our fellow tour participants became quite emotional when he revealed that his ancestors had actually sailed on one of the original famine ships from Ireland. This one also has a fee, and is a guided tour. It’s free to holders of the Dublin Pass. 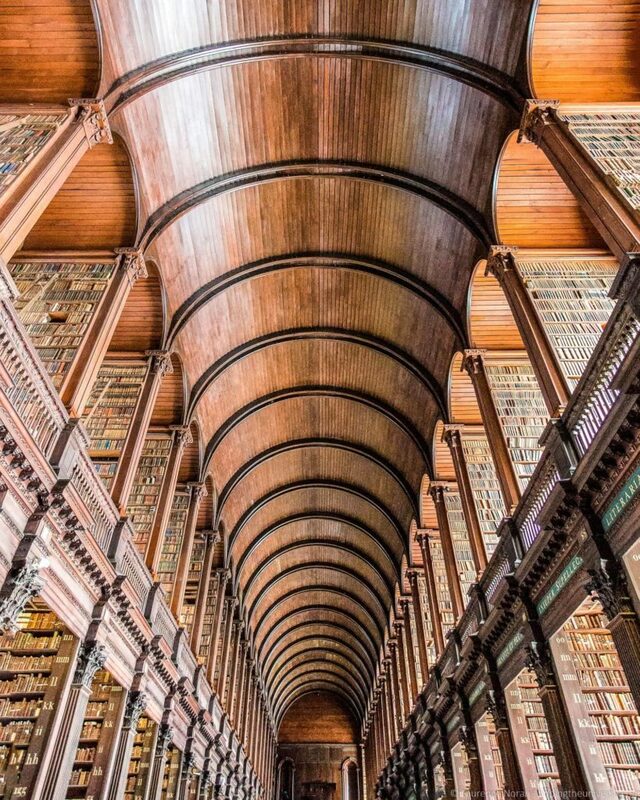 Trinity College is the only college of the University of Dublin, and is generally considered to be the best University in Ireland. It was founded in 1592 by the first Queen Elizabeth, and as you might imagine, it has a rich history and a number of impressive buildings that you can both look at and visit. The most popular sight though is the Old Library. Dating from the 18th century, this magnificent room houses over 200,000 books across two stunning floors. It’s over 200ft long, and is a sight you have to see. As part of your visit, you will also have access to the Book of Kells – the world’s most famous medieval manuscript. This is a 9th century decorated copy of the four gospels, and is generally regarded as Ireland’s greatest cultural treasure. Time for some art! And for that, we’re going to head over to the National Gallery of Ireland. This is free to enter (with the exception of any special exhibitions), and is home to over 2,500 paintings and 10,000 other works of art. As you can imagine, there is plenty to see here. 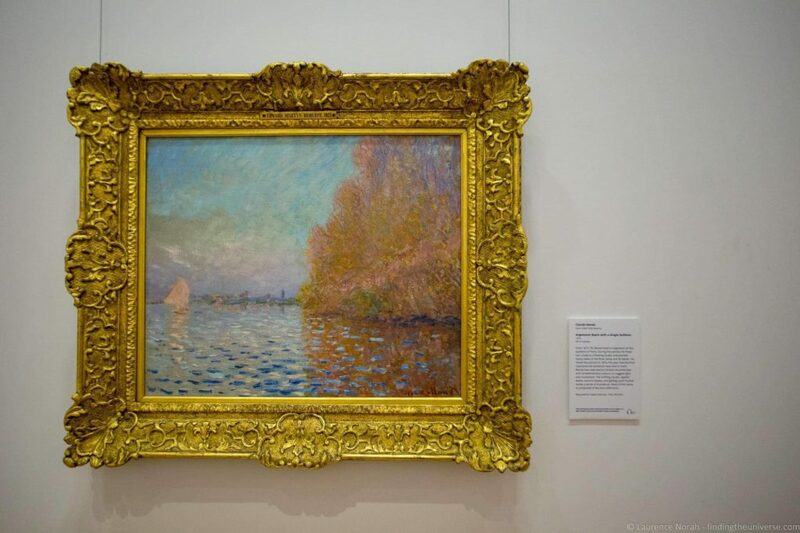 The National Gallery is home to Ireland’s collection of Irish and European art, including paintings by Turner, Rembrandt and Irish impressionist Walter Osborne. 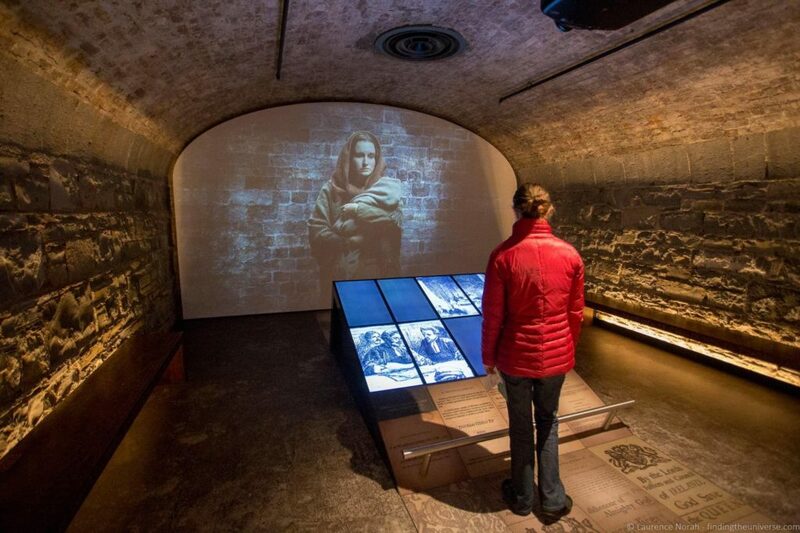 If you want to learn about what life was like in Dublin through the 20th century, then a visit to the Little Museum of Dublin should definitely be on your list for your Dublin visit. 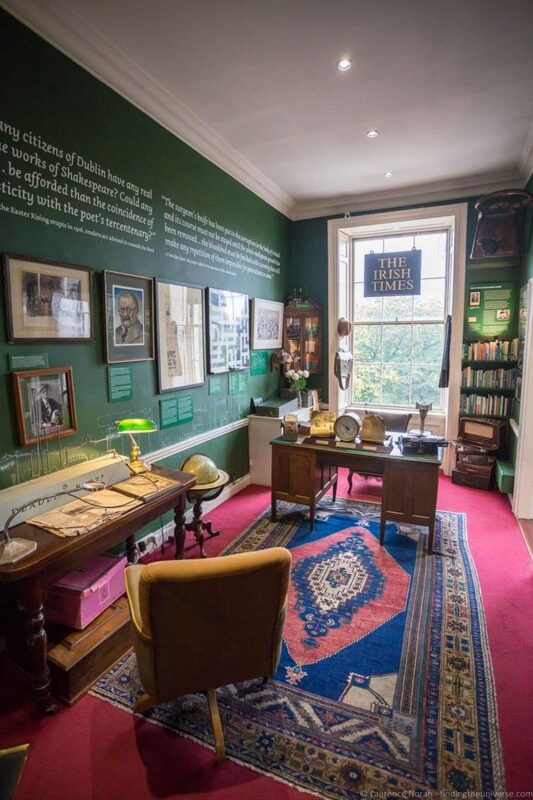 This people’s museum takes you on an intimate journey through life in 20th century Dublin, and has over 5,000 artifacts on display in that time period. There’s also an exhibit on U2, Ireland’s most famous rock band, which you can visit without taking a tour. Be aware, this is quite a small museum, and the main exhibition has to be seen on a guided tour. Slots on these tours can fill up quickly at busier times of year as the museum is popular, so to avoid disappointment we would advise booking in advance, which you can do on their website. Holders of the Dublin Pass get free entry, however you should call or e-mail to reserve your place as the website doesn’t have the option to say you have a Dublin Pass for advance booking. Contact details are at the bottom of their website. A shopping centre? No, we haven’t gone totally mad. 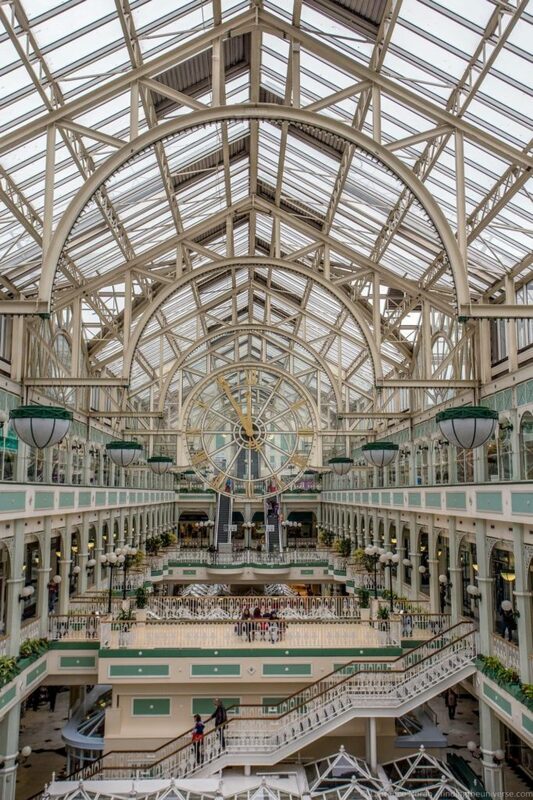 We just love the interior design of this shopping centre, with it’s glass and steel interior, which reminds us of a Victorian era rail station (or shopping arcade). There are of course plenty of shops and a food court in Stephen’s Green, should you need any retail therapy or a reasonably priced quick bite to eat. But our favourite thing to do is admire the view down the length of the arcade from the stairwell near the entrance, looking down towards the giant clock. One of Dublin’s most popular sights, and not one that we’re going to miss on our itinerary, is the statue of Molly Malone. 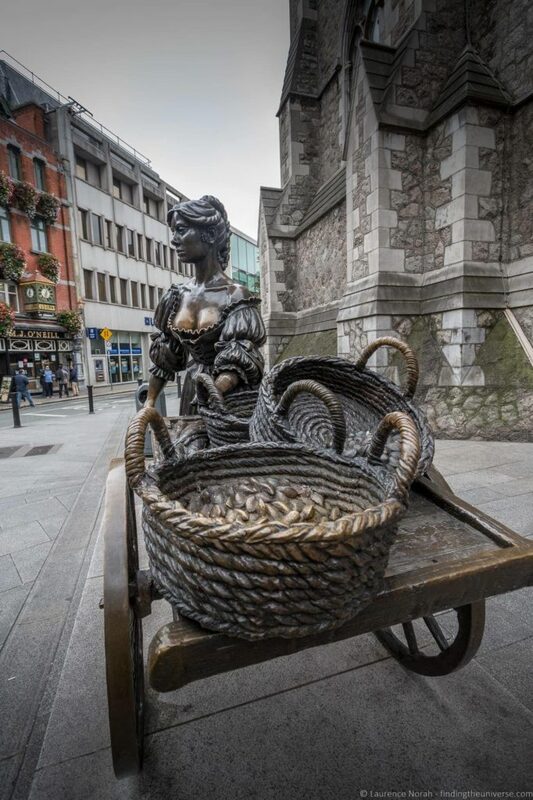 Molly Malone is the fictional heroine of one of Ireland’s most well known songs, with the story going that she was a fishmonger who plied her cockles on mussels in Dublin’s fair city. Fictional or not, her statue is a must when visiting Dublin. It’s usually located on Grafton Street, but due to construction work, at time of writing is just outside the Irish tourist information office on Suffolk Street. 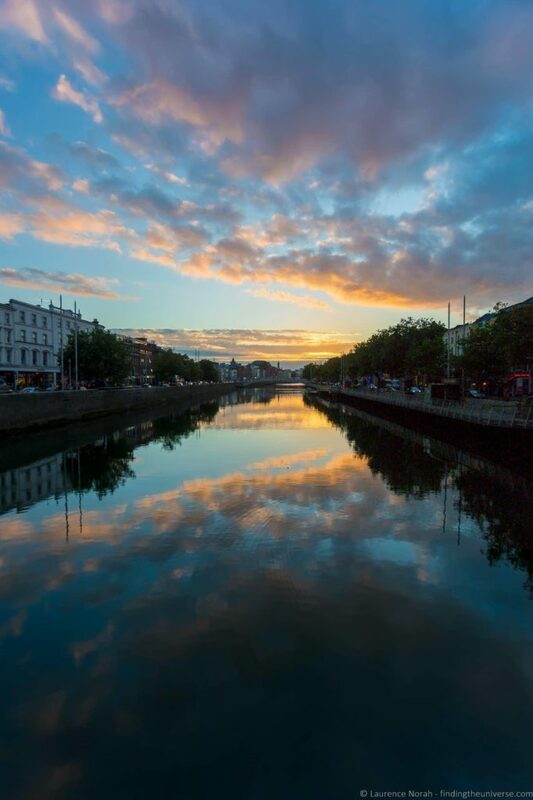 We’re coming to the end of our first day in Dublin, and what better way to finish off than by watching the sun set over the River Liffey, which runs right through the centre of the city. Of course, the sunset time will vary depending on the time of year you visit, and you have to be lucky with the weather, but sometimes the sky can put on a real show! Any of the bridges will offer you a good view, although if you can get the beautiful Ha’Penny bridge in your photo, you’ll be on to a winner. Last but not least, our first day ends with a tour of the Temple Bar district. This is the party capital of Dublin, and if you’re seeking out pints of Guinness, live music and lots of “craic”, this is definitely the place to come. Yes, it’s full of tourists and the prices are higher than everywhere else in town. But it also a lot of fun. 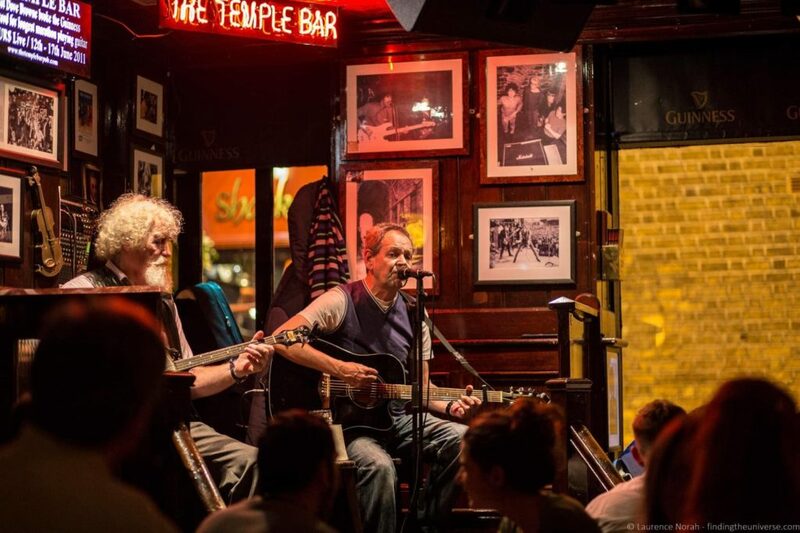 Check out this guide to the best bars and pubs in Temple Bar to give yourself a plan of where to go for your evening of fun. Our second day in Dublin has you visiting a cathedral, a gaol, learning about the history of the city, and of course, finishes off with a pint of Guinness! Dublin Castle is not quite a castle as you might be expecting, although there has been a castle on this site since around 1166. 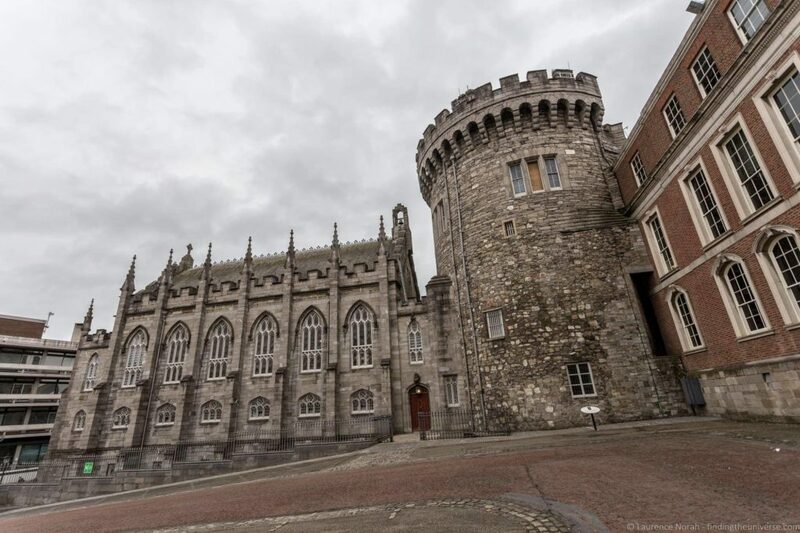 In fact, the only real “castle” looking part of Dublin Castle is the Record Tower, which dates from 1228. The rest of the Dublin Castle complex, which has been built up around the old medieval castle, is home to a number of government buildings. These include the Irish government state apartments, which are used for official state engagements, as well as the Garda (Irish police) Museum and the Chester Beatty Library museum. All of these can be visited. Visiting the main Castle, which includes the State Apartments, requires a ticket, and you can either do a self-guided tour or a guided tour. The former is free for holders of the Dublin Pass. The Garda Museum is free as is the Chester Beatty Library. Note that access to Dublin Castle may be restricted due to government events or activities, so check the website before your visit to avoid disappointment. 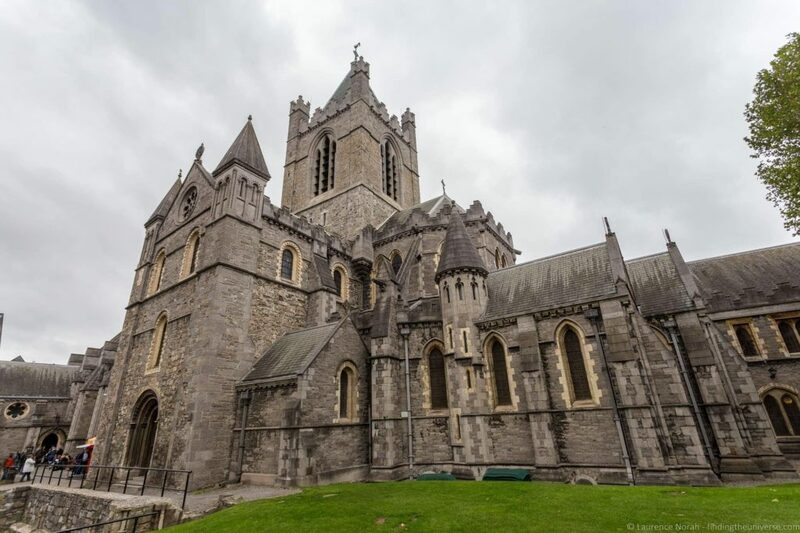 Founded in 1028, Christ Church Cathedral is Dublin’s oldest medieval cathedral. It’s a spectacular Gothic / Romanesque construction, and serves as the seat of both the Church of Ireland and the Roman Catholic church in Dublin. It will be recognisable to fans of TV show The Tudors, as many scenes from the show were filmed on site. There’s plenty to see here. The crypt contains a number of attractions, including a mummified cat and rat, and an extensive silver collection. Entry is ticketed, and you can buy your tickets online or in person. It’s free to holders of the Dublin Pass. 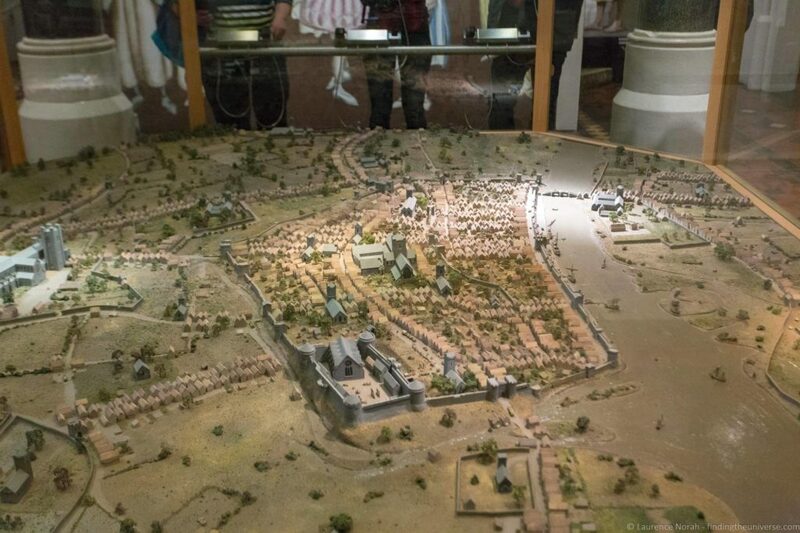 Right next door to Christ Church Cathedral is Dublinia, a fun museum which tells the story of medieval and Viking Dublin. This part of the city was the heart of medieval Dublin, although other than the cathedral buildings, not much survives from that time period. Still, a visit to Dublinia will give you a glimpse into what life in that time period might have been like. There are recreations of houses and street scenes from the time, and lots of information and hands on exhibits.. Naturally the Plague, or Black Death, is covered, and there’s also a whole section devoted to how archaeologists have unearthed the past to bring it to life. You can also go up to the top of St. Michael’s Tower, a 96 step climb, for reasonable views across the city. Entry to Dublinia is ticketed, with tickets available online or in person. Entry is free for holders of the Dublin Pass. The attraction which is furthest from the centre in our two day Dublin itinerary is Kilmainham Gaol. Don’t worry though, this 18th century gaol no longer operates as such, and is today run as a museum by Ireland’s Office of Public Works. Kilmainham Gaol is worth visiting for a number of reasons. First, it has seen some notable inmates – in particular, the leaders of the 1916 revolution were detained and executed here by the British, as were leaders of many other rebellions over the years. The Gaol also housed thousands of ordinary Irish citizens, held for crimes ranging from food theft to murder. Film fans will also recognise this as the gaol that Michael Caine is held in in the original Italian Job movie, and more recently, where Paddington Bear is held in Paddington 2. 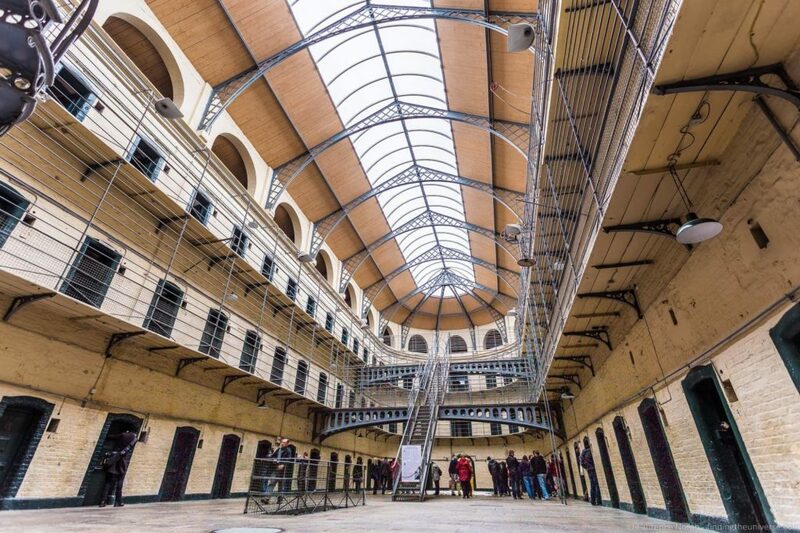 Visiting Kilmainham Gaol is only possible on a guided tour, with tickets sold for specific times. Tickets are available for walk-ins, however this is a very popular attraction and we highly recommend buying your ticket in advance online to avoid disappointment. Our last stop, and the perfect way to end your two days in Dublin is Dublin’s most popular visitor attraction – the Guinness Storehouse. This is on the site of St James’s Gate Brewery, where Ireland’s legendary drink has been brewed since 1759. Today, over 50 million barrels of Guinness are produced annually on this location. The Guinness Storehouse is a seven storey visitor attraction arranged around a central atrium which is shaped like a traditional Guinness glass. If actually filled with Guinness, it would hold 14 million pints! The tour goes across all seven floors, and covers everything from how Guinness is made, through to some of its iconic advertising through the ages. Finally, the tour culminates at the Gravity Bar on the seventh floor, where you get to sample a pint of the good stuff (included with your ticket), and admire a spectacular view of the city. 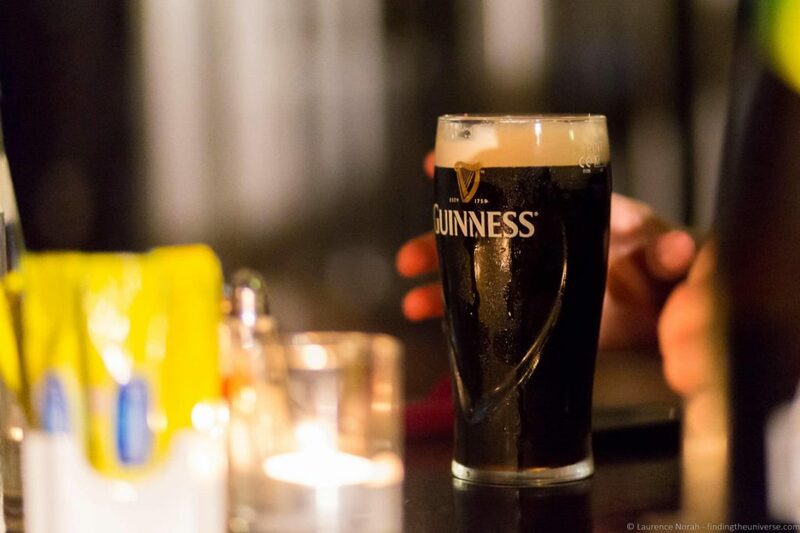 Not a bad way to end your last day in Dublin, we think you’ll agree. At time of writing, it’s €25 for a ticket, with last entry at 5pm, and the storehouse closes at 7pm (one hour later for last entry and closing in July and August). You can buy your tickets online, which can save you up to 30%, plus you get access to the fast track queue. You also get free entry and access to the fast track queue with the Dublin Pass. To help you visualise our itinerary we’ve put it into a map, showing all the locations above divided by the two days. You can see this map on Google Maps here. Safety: We’ve not had any problems in Dublin, just take basic precautions with your valuables and personal safety, and you should be fine. Power: Electricity is of the 220v standard, with the three pin plug that is also used in the UK. Travellers from anywhere else, including other countries in Europe and the US will need an adapter, and US travellers need to check their equipment supports the 220v standard – it will be written clearly on the power adapter. Currency: Dublin is part of the Eurozone, so the currency is the Euro. You can get these from ATM’s, banks and currency exchanges, although credit cards are of course widely accepted. Euro’s from other eurozone states are of course accepted. Water: The water in the taps in Dublin (and Ireland) is perfectly safe to drink unless otherwise posted. If you don’t like the taste, bottled water is widely available. Dublin is a fun city to visit at any time of year. In the summer months you’ll get warmer days with more hours of sunlight. In the winter, it will be less busy, but darker and colder. Attractions are for the most part open year round in the city, but always check opening times in advance before visiting. Whenever you visit, you will want to be prepared for all weathers – Ireland is known as the Emerald Isle, and all that greenery takes plenty of watering, so rain is a possibility at any time of year! Dublin is an easy city to get around on foot, and we have laid out our itinerary in the most logical way so you should be able to walk between most of the attractions. There are a few hop-on hop-off (HOHO) buses in Dublin, one of which is included as part of the Dublin Pass. This will get you to all the sights in our two day Dublin itinerary, and you will likely find it most useful on your second day, as the Guinness Store Factory and Kilmainham Gaol in particular are a bit of a trek from the city centre, and the HOHO bus route goes right past these, as well as the majority of the other day two stops. 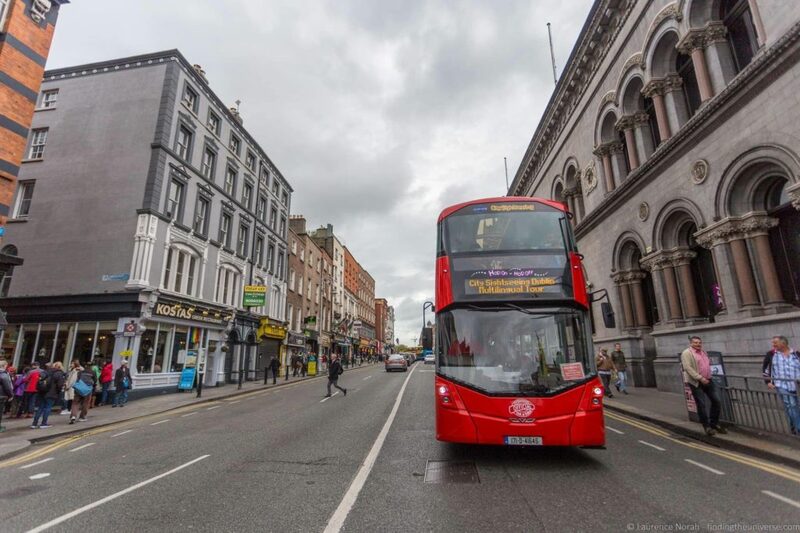 There are also public buses in Dublin for which you can buy tickets directly from the driver, with prices varying depending on the distance you are going. There are also taxis of course to get you where you need to go. Dublin is not a budget city, but there are plenty of options in the city to suit most budgets, from hostels through to upmarket hotels. We’ve stayed at a number of hotels, from hotels like this through to hostels and AirBnB’s. Finally, much as we love them, AirBnB aren’t the only game in town. Check out our guide to the best AirBnB alternatives for lots of other accommodation booking options for your trip. As mentioned above, Dublin is not a particularly cheap destination to visit. The main costs when you’re in Dublin are going to be food, entertainment, accommodation and sight-seeing. For food, you can save money by cooking for yourself at your hostel or apartment – but don’t hold back on dining out, as this is one of the fun things of visiting Dublin. Expect to pay in the region of €12 – €18 for a meal at a pub type location. For sight-seeing, our recommended way to save money is to invest in a Dublin Pass. We’ve used these on a number of occasions when visiting the city, and for a two day visit that includes a number of attractions, the savings can really add up. At time of writing, a two day Dublin Pass costs €77. If you were to visit all the attractions in the list above that are covered by the Dublin Pass, plus use the HOHO Dublin bus (valued at €19), it would cost you €100. Add in the fact that it also includes a number of other discounted attractions, such as 15% off the airport transfer, and you’ll see that you can easily save with a Dublin Pass. Plus it includes a number of extra attractions that you can pop in and see, creating even more value! Definitely worth checking out for your trip. 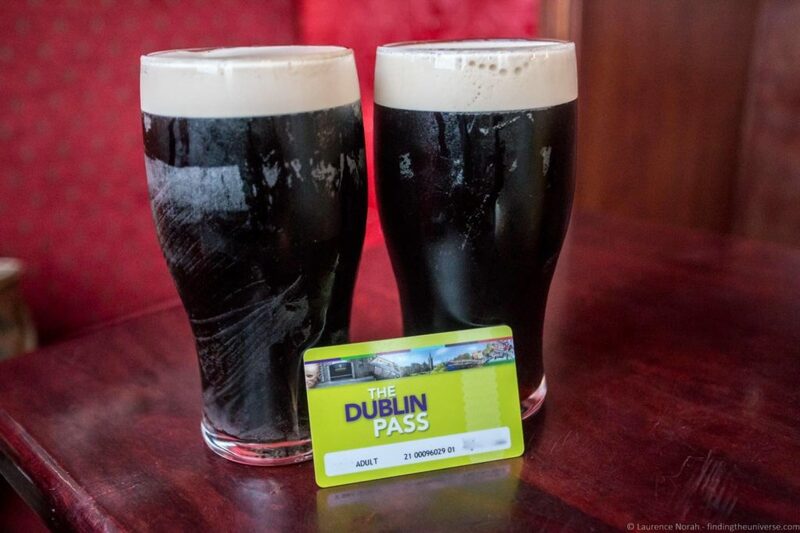 You can see our full review of the Dublin Pass here. And that sums up our itinerary for the perfect two days in Dublin! Before you go though, we wanted to share some resources that you might find useful for planning your trip, both content we’ve created ourselves, and third party books and websites that should come in useful. We also have a guide to what to do in Dublin, for even more ideas! A popular day trip from Dublin is a visit to the Cliffs of Moher. Read our experience doing just that here. Another popular attraction, although in Northern Ireland, are the Game of Thrones locations. Check out our guide to visiting the Dark Hedges for more on that. For information on events, happenings, and more ideas for what to do in Dublin, take a look at the official Visit Dublin website. If you want a guidebook, we’re fans of Rick Steves. Check out his Dublin Snapshot Guide for insights and ideas for your trip. And that’s it! 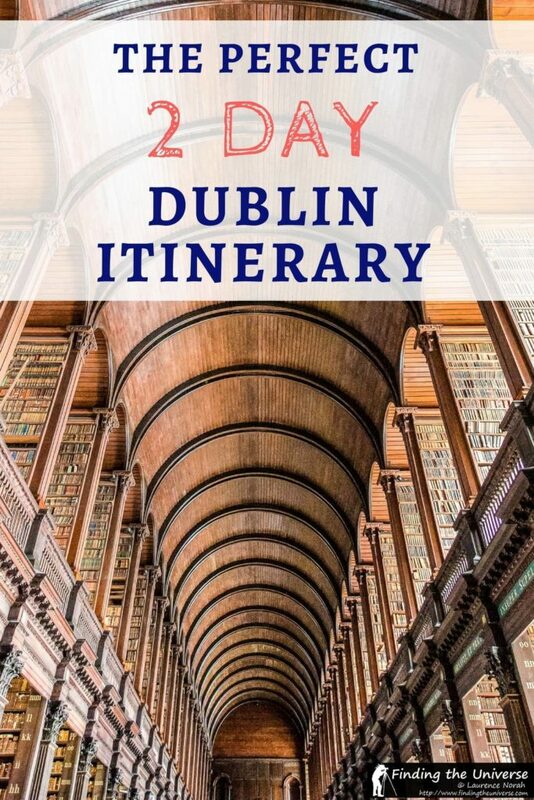 We hope you found our two day Dublin guide useful, and are happy to answer any questions in the comments below. Hoping you can offer some additional advice. 4 of us (over 55) are planning a trip to Dublin in July 2019. Two days in Dublin, then heading to London for a weekend then, back to Dublin for two days. The two day guide of the city is great. Do you have any suggestions about the best way to see the city as well as see more of the country’s sites (do we rent a car, take a bus tour)? Thanks for your comment, and I’ll certainly try to help. So depending on how able you all are, Dublin is certainly a walkable city for the most part. That said, the Hop on Hiop off bus is also excellent, and covers all the highlights you’ll want to visit. In terms of day trips, we can suggest taking a day trip to the Cliffs of Moher, or heading up to Belfast for the day. The former is easiest by bus tour, the latter can be done easily by train. I hope this helps – let me know if I can be of further assistance, and I hope you have a great trip together! Thanks Laurence. That’s pretty much our plan at this point. Walking is no problem while in Dublin, and a day trip to the Cliff of Moher is on the itinerary. It’s the South we’re struggling with. We want to maximize seeing as much as possible with a day or two. Do we rent a car or take a tour? Renting a car will likely be more cost effective and let you see things at your own pace, whilst taking a tour will mean you can let someone else worry about the driving, plus you’ll likely learn a few more things as you go from your guide. So it’s up to you – I think they both have positives and negatives, and it will depend which you prefer ultimately! So heading to Dublin meanwhile this blog was so informative to me….and i think this was a perfect universe thanks a lot for sharing such a wonderful article keep posting!